Will I need a permit for an outdoor event? Yes, you will definitely need permission or a permit if the function is not on property you own. If it a large function with hundreds of people you will need to check with your local municipal office before erecting a tent. There are laws and regulations that govern how many people are allowed in a tent or built area like a hall at the same time. 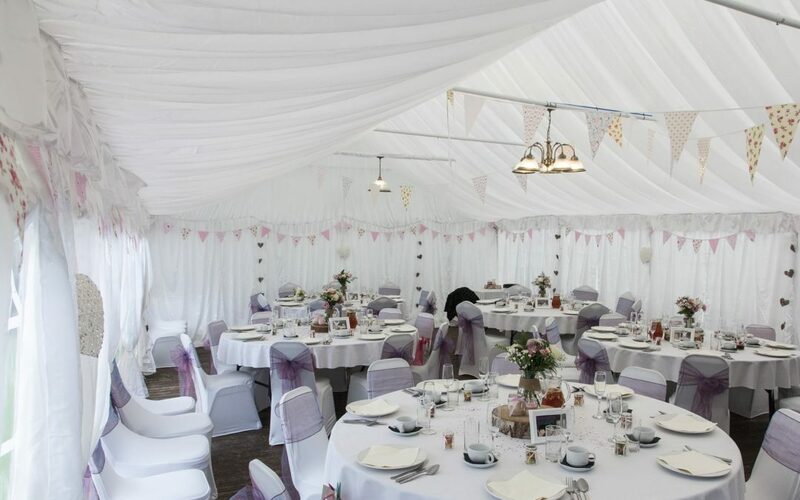 Try to ensure that your tent is roomy enough to fit your guests (it is better to err on the side of caution and ensure you use a tent bigger than the one suggested for your number of guests). Usually, a tent manufacturer who has tents or frame tents for sale will be able to assist you with advice in this regard. This will depend on the number of guests and what type of seating you want. If you are hosting a cocktail party you will be able to fit more people into a tent than at a formal sit down event. Your best bet is to sit with a tent supply company and discuss your options like I did. They are far more knowledgeable in ascertaining what each function requires based on the number of guests you have invited. Will I need flooring for my tent? This depends on the ground you are pitching your tent on. In our case, our grass was lush and lovely thanks to the lovely Midlands climate so we were advised by the consultant not to waste our money on flooring. Finding an honest tent manufacturing company who is not out to make a quick buck but is focused on customer service is essential. I was convinced we would need to hire expensive flooring for the function but he explained to me that the beautiful grass was part of the experience of a farm wedding and a hired floor would not add much value to the function. If however, our grass was patchy, our ground was sandy etc he would have advised differently. You will need to assess your space as well as your budget before you decide if a floor is necessary. What is the difference between a peg and pole tent and a frame tent, do I really need a more expensive frame tent? Pole tents are the ones that have peaks and poles through the middle. They are often used at small markets or fairs. Frame tents have an aluminium or steel structured frame (imagine a drawing of the framework of a house made with aluminium) that custom made tarp or canvas is placed over. Frame tents are ideal for concrete or ground. Pole tents cannot be erected on concrete as they need to be staked into the ground. How long before my event should I book a tent, chairs and tables? You should look at finalizing details like this at least 60 days before an event as the tent you need could get booked out and you may have to spend unnecessary time shopping around again for a reliable vendor. How can I keep my food and drinks at the right temperature if I am having a function outdoors? We hired mobile chillers and used fire and gas stoves to heat up food. Your catering company will be able to advise you on your best options for keeping your food and beverages at the correct temperature. You can also use large buckets with ice if you have a small number of guests. You will have fewer drinks to keep cool so ice buckets will work fine in this case. What can I do about restrooms? We hired a mobile restroom that was actually a little caravan with a few toilets and sinks. It was actually much more pleasant than the traditional single portable toilets you find at fairs. It was far more spacious and attractive as well. Look at your local tent manufacturers and event hiring companies for these. Always choose a venue that is as close as possible to a parking area. You do not want guests to drive around frustrated for a long time looking for parking and then have to walk in the hot sun to your tent. If the parking area is far away, consider hiring a park and ride service on a golf cart or tuk-tuk for the event. To calculate how many parking spaces you will need, allocate 1 car per family invited and then add about 15-20 more cars to your number for service vehicles and families who may use more than 1 vehicle to travel to your event. Will I need to hire security? It is advisable to hire security for your parking area as well as at the entrance. This is to ensure that only guests and caterers attend your function. Here’s a pro tip: Ensure all service providers work with badges or some kind of identification. You can even print out unique identification cards for your function and give a specific amount to each service provider for their staff. This way you have control of who accesses your function as your security can be instructed to only let people with your unique identification card or invitations enter. Make sure your security for your guests looks friendlier (more like a host than a bouncer) and plays the part so your guests are not put off when their invite is requested. You could also print your seating plan on your invite with their seats marked on their card individually. This will be a good excuse for your ‘host’ to check their invite and direct them to their seating in a subtle way. Often, petty criminals or opportunists looking for a free meal or trying to hustle can try their luck at outdoor events. Hiring some light security will ensure you and your guests are relatively safe. This post was brought to you by Empire Tents. Empire Tents is a tent manufacturing company in Durban. We offer 20×20 frame tents for sale, frame party tents for sale, commercial frame tents for sale and relief tents for sale.